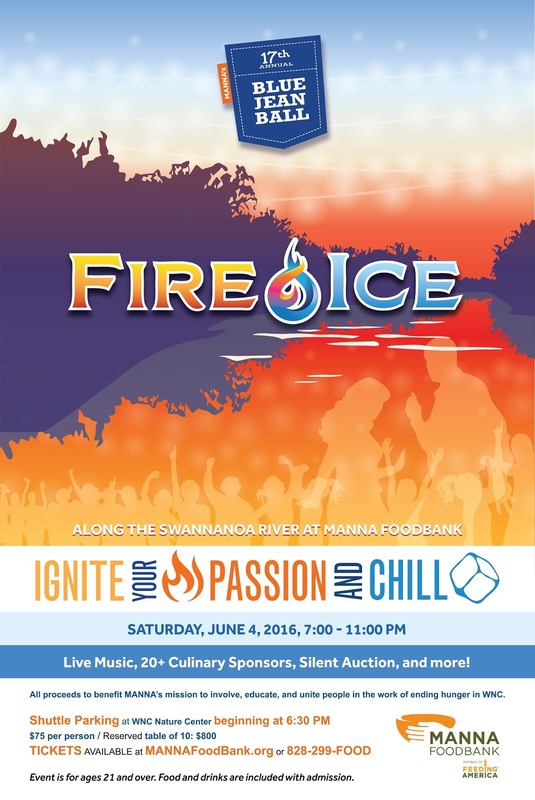 Ignite your passion to fight hunger while relaxing on the banks of the Swannanoa River at MANNA FoodBank’s 17th Annual Blue Jean Ball, Saturday, June 4th! Don’t miss Asheville’s favorite June fling, featuring small plate grazing and desserts from a range of Asheville’s top restaurants – from Biltmore to Rosetta’s Kitchen – and dozens of wines and beers from which to choose. Get inspired by the FIRE & ICE theme and glam up to win costume prizes for Hottest, Coolest, and Best Hot and Cold Duo. Dance the night away with DJ Nigel, and the fabulous Jesse Barry and the Heat – Asheville’s own American Idol Hollywood finalist backed by nine of Asheville’s top musicians! Take a break from the dance floor to enjoy entertainment from Christine Garvin Dance – a 10-person dance troupe whose performance is created especially for this event theme and always brings a fun surprise – and shop the stunning array of treasures in the Blue Jean Ball silent auction tent. Tickets are $75, and are all-inclusive. This event is for ages 21 and over. Call (828) 299-3663 or go to MANNAFoodBank.org to purchase tickets. Empire Distributors of North Carolina, Inc.